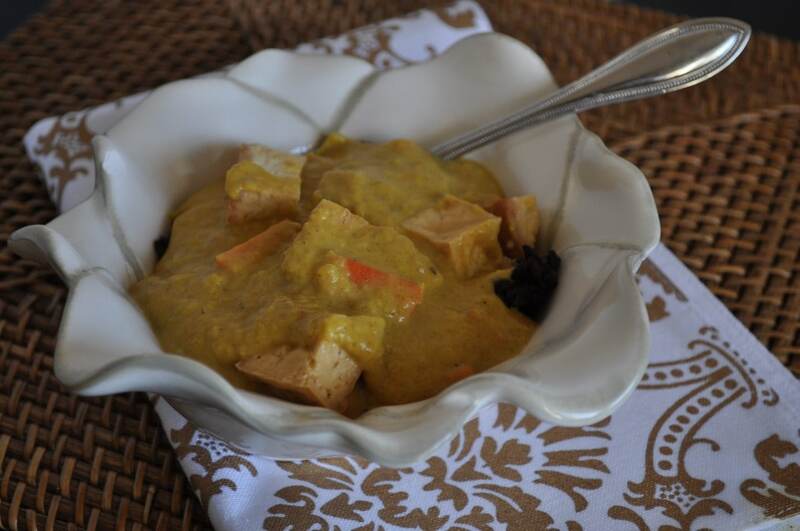 This pumpkin coconut curry is a little on the rich side, but it is good! We have been wanting to do a curry recipe for a while and when we had some leftover coconut milk this week, we knew we had to try. It is really yummy! 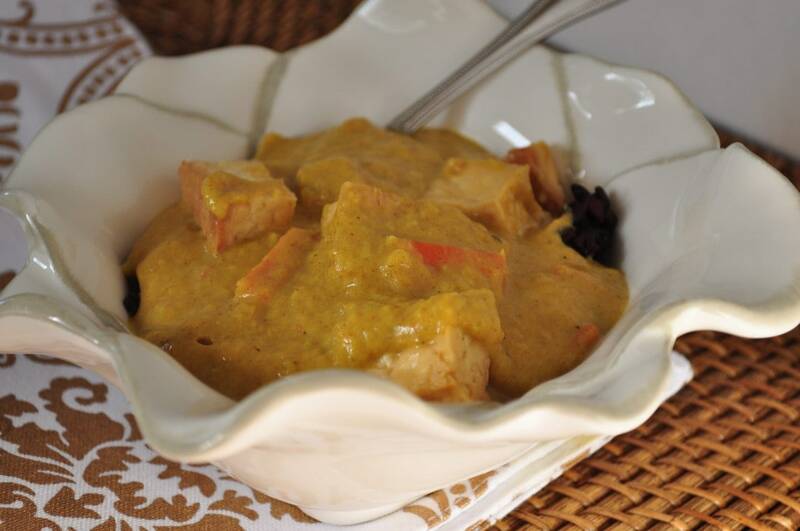 This pumpkin coconut curry is great for this time of year. Especially if you have leftover pumpkin in the freezer like we do. We roasted the girls HUGE pumpkin from Halloween and will be eating it for a while. It will warm you up on a cold day. which we happen to be having right now. It makes a lot too! Add coconut oil, onion, and carrots and red pepper flakes in pan and lightly saute. Reduce heat to medium and add coconut milk, veggie broth, and pumpkin and let it sit for about five minutes. Add everything else, reduce heat to medium-low, cover, and let it simmer for about 30 minutes stirring occasionally. We added baked tofu to ours, but you could add in your favorite protein instead. It’s also very good served over black rice. Enjoy! I love curry. I love this recipe, as I do so many of the recipes you post. Thank you for all of them. Thank you for your kind words Felice! I'd like to make this recipe but I have no mirin. Is there a good substitute (eg rice wine vinegar?) or can I omit it completely since the recipe only calls for a 1/2 T? Thanks. You can probably just omit it and it will be just fine. I finally got around to making this. My 2 year old son and I loved it but my husband found it a little bland (he's used to processed foods though). I did end up leaving out the mirin and don't think it made a difference. I also added sweet potatoes (good idea Hannah) and chickpeas to make it a little heartier. I think it's a little more of a soup than a stew otherwise. It was a great lunch on a cool fall day. Thanks! Awesome! I'm so glad you enjoyed it. I made this last night, and my whole family loved it. I added chopped sweet potatoes and chicken, but I'm sure it would be good without those, too. T = tablespoon and tsp = teaspoon. Maybe the tofu is pan fried when you go out to eat? I bake mine so the texture is a bit different. My step mother is Korean and she always pan fries her tofu. Maybe you can try that next time? What didn't you like about the texture? That may help me advise you. Thank you, I will try pan frying it next time. I don't know if it is the lack of flavour or the chewy texture that bothers me. I will keep trying. You can season it up before frying. I usually don't add anything else but salt because I throw it in different dishes. Maybe brushing some toasted sesame oil on it before baking or frying? My husband made this for me for dinner tonight (I'm on the MSPI diet) and I loved it! He added some cinnamon in with the spices, and also added chickpeas. It wasn't too soupy when served over rice - it was pretty similar to most Indian dishes I've had. We'll make this again! Oh great! I bet cinnamon tasted really good in that. Glad you liked it! I used the canned milk. Is the pumpkin mashed or chunked? I am looking for a good curry recipe for my girls and they love pumpkin flavor. If it is mashed they might enjoy the curry more. It becomes very smooth in the curry. Not chunky at all. I made this today and added chunks of roasted butternut squash and extra firm tofu. For the tofu, I sprinkled a bit of curry powder and paprika and toasted it, then added sesame oil, which I sautéed it with. This recipe is so yummy and warming on a cold winter day!